These days, a big weekend in Ottumwa, Iowa, population 26,000 or so, is defined by the line out the door at its Applebee's. On its chamber of commerce's list of 101 things to do there, you'll see attractions like genealogy research, pumpkin picking, and a tour of the John Deere factory. The same as most towns spread out on the frying-pan flat Midwest of the United States, Ottumwa is the kind of place whose charm you'd come to understand not if you bothered to visit, but if you cared to stay. However uncomplicated and guileless it may seem, Ottumwa still is the Video Games Capital of the World. The honor might be 26 years old, self-bestowed, and rooted in the long-gone days of arcade gaming. But no other city has laid claim to the title. And Ottumwa hasn't abdicated it. And some think this place might be a good location, some day, for a video games hall of fame. Chris Hoeksema, 29, lives in Ottumwa and grew up in nearby Pella. He thinks Iowa embodies perfect video game country. "There isn't much to do in this state," he says. "There's only so much cow tipping you can do before you get bored." When he and his friends did, they headed down to a roller rink to feed quarters into its machines. Hoeksema was only 3 years old when Ottumwa was the epicenter of no less than a pop culture earthquake. The stories of that time were sort of murky half memories, built as much on what others recall as what Hoeksema himself thinks he remembers - video games lining the streets, records being set, the governor coming to town, stuff like that. But talking with others of his generation, the memories matched up. The stories of Ottumwa were true. Ottumwa's heyday was unique enough to Hoeksema that, at least, it shouldn't risk going another few years of being barely remembered or almost forgotten. And more than Ottumwans should remember the significance. "We thought, wouldn't it be great if we could revive the idea that Ottumwa is the Video Games Capital of the World," Hoeksema said. So he left an email message for a guy whose name he'd heard, someone who had been in Ottumwa around the time: Walter Day. "Walter's response was just - ‘Call me.'" Hoeksema said. If Ottumwa has any legacy in video games it is owed to the out-and-out miracle of self-promotion wrought by Day, who put an arcade there in 1981 called Twin Galaxies. Video gaming was in its nova stage as a pop culture phenomenon, and in a January 1982 cover story on the craze, Time magazine reported that 15 million was the highest mark ever achieved on Defender, the iconic side-scrolling space shooter from the first arcade boom, literally engineered to provide an average of 90 seconds of gameplay. One of Day's local players set out to beat that score and did so, racking up 24 million in front of a tremendous crowd and a media throng. Day contacted Williams Electronics, the maker of Defender, to ask if they would certify the score as the highest ever. Williams didn't keep such records. It didn't know what the highest score was for this game. Neither did any other game maker for theirs. The only one with anything close to a comprehensive database of scores was Day himself, who had gathered as many as he could from visits to more than 100 arcades he'd made while scouting out a good location to open one. So Day did the only thing he could think to do - he certified the score as the world record, the first one recognized by Twin Galaxies. Then he called the leading game manufacturers and recommended they refer all high score inquiries -they got dozens per day - over to him. Within minutes his arcade got an inquiry, via Midway, about a high score on Galaga. From that first query a quarter century ago to today, Twin Galaxies, of Ottumwa, Iowa, is acknowledged as the sanctioning authority for all scores, times, marks and achievements in video gaming, arcade or console. More than just a few game companies and industry media took notice. Mainstream outlets seeking a sense-of-place location for features on the video games inevitably sent reporters to Ottumwa, thanks to Mayor Jerry Parker's shrewd proclamation of the town, on Nov. 30, 1982, as the Video Games Capital of the World. "The Dodge City of Video Games" is how a wire service put it, with world class players from all over the country, and others too, having their showdowns in Ottumwa's "Video Game Olympics." Iowa Gov. Terry Branstad, joined by top Atari executives, would visit Ottumwa. 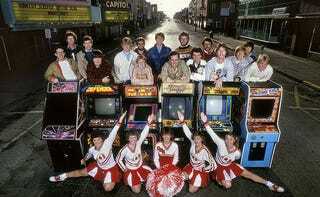 Ultimately, Life magazine took a picture that became representative of America in the thrall of its first video game love: Sixteen guys, all elite players, lined up in the middle of Main Street behind six arcade cabinets and a cohort of Ottumwa High cheerleaders. "There was not one obstacle at any point back in that time," says Day, a trim, bearded man known for singing and writing his own songs, wearing a referee shirt, and speaking in soaring "feeling bites," rather than sound bites. The media and the public had this cultural need to get their arms around video games, and they found it in Twin Galaxies," Day said. "A bunch of phenomenology that was already in place found Ottumwa to be its lightning rod." He's confident that can be channeled again. "Ottumwa should be the site for the video game hall of fame." No one has yet planted the flag for a video games hall of fame in the United States. Perhaps the closest anything might come is a "Walk of Game" begun inside the Metreon in San Francisco, almost purely as a private marketing venture. It only inducted two "classes" and fizzled out in 2006 after being largely ignored. The longest running and most notable museum exhibit on video games is Videotopia, which is a traveling exhibition with no permanent home. Ottumwa's biggest problem, in being considered a credible home for video game history and achievement, is that the gaming culture it represents is extinct in America. Arcades are long gone - few more so than Twin Galaxies itself, which closed in 1984 partly as a victim of the infamous video game crash. "People haven't really heard of it," said Dr. Mark J.P. Wolf of Concordia University in Wisconsin, one of the foremost historians of video gaming, who edited "The Video Game Explosion," the subject's first scholarly work. "But then again, Cooperstown, N.Y. is best known for the baseball Hall of Fame, and what was it known for before that?" Actually, Cooperstown had less of a factual connection to its subject than Ottumwa, however obsolete, does to its. The story describing baseball's invention in Cooperstown has long since been debunked. What's important is that the idea of a Hall of Fame there was unilaterally acted on by the community's leaders, after a wealthy resident bought a relic baseball that had been found in a nearby barn. "It's not like you have an artist's colony for video games, a place where you have a whole bunch of things developing over time," Wolf said. "Maybe the closest thing would be something like Silicon Valley, where you have most of the companies. But you'd think they'd have funded something like that by now. It's interesting that they haven't." • Independence. If a hall of fame were funded principally by one company, "it's hard to believe someone like Microsoft would be unbiased about the achievements or significance of PlayStation as they would be about Xbox, and vice versa," Wolf said, "whereas Twin Galaxies is not beholden to any particular company." • Permanence. Few brands are as prominent today as they were at the beginning of video gaming - Nintendo being about the only one. Companies have been bought, sold, folded and moved. While the Twin Galaxies arcade is closed, its record book is an institutional memory spanning all generations of games, Wolf said. "It would make sense to most of the public to have a hall of fame somehow connected to high scores." • Location. Yes, it could actually work in Ottumwa's favor. Sure, it's about four hours from the nearest major airport (Kansas City) - so is the baseball Hall of Fame. "It's still a central location in the United States," Wolf said. It might be out-of-the-way, but it's equally so for both east and west coast tourists. Jeff Anderson, the owner of Videotopia, the nation's leading traveling video game exhibition, doesn't reject the idea of a hall of fame in Ottumwa, but is skeptical considering the realities he's seen in more than a decade of touring his show. "I guess you could say it's a crossroads of America," Anderson said, "but at the same time, it'd be the last place I would expect a museum would really have the kind of draw you'd need." That's speaking, of course, from the standpoint of an exhibition hall showcasing any artifacts from video game history it could get. The kind of scale one would imagine of a full service hall of fame would require "a ridiculous electric bill," for starters. Anderson said he's heard of several abortive attempts to open video game museums and/or halls of fame, most recently in Orlando, Fla. The efforts broke down pretty quickly, largely because of the overhead - storage, maintenance, staff, utilities - people confront once they crunch the numbers. By his estimation, a full service video game museum would need to bring in at least 1,000 visitors per day, if not upwards of 2,500. Anything in Ottumwa would have to start small, and establish some sort of position. Maybe in hopes that when larger interests inevitably explore this concept, they'd decide to back or buy into the existing one. "Sooner or later there'd be interest in (starting one)," by a big company, Anderson surmised. "But gaming companies now don't really have a direct line to the past. Technology began at a very different place then rather than now." If They'd Come, Would You Build It? Earlier this month, Ottumwa's annual Home Expo sold out the 30,000 square foot exposition floor at its brand new Bridge View Center, a 95,000 square foot events hall at the bend of the Des Moines river. The culmination of more than a decade of work and planning, built with the help of $7 million in state funds, Bridge View is proof that Ottumwans get big things done. Would the community ever put that kind of muscle behind video games? "There probably is something there that we're not capitalizing on, and probably should," said Terry McNitt, the executive director of Ottumwa's chamber of commerce. "We do need something to brand our town. And when I look at this thing, it's there. Nobody's ever taken this sort of thing and run with it." McNitt, like any good chamber leader in a town his size, launches whole squadrons of facts and selling points when you ask what Ottumwa's got going for it. The population, for starters, has actually grown there recently. It may be difficult in hard times to get members to ante up for the annual holiday lights celebration. But it won't last forever, and tourism definitely gets the attention of merchants, who healthily back things like bringing a statewide bicycle race back through town, because of the near-doubling of the population the event brings. After a recent meeting with developers looking to stick a steakhouse chain in town, McNitt was told Ottumwa is a "sleeper" community - the fact it can draw 125,000 from a 70 mile radius is significant to those who write checks that start bulldozers and cement mixers. "I think there are probably things that have been covered up that need to be brought back," McNitt said. "Gaming, it's so huge, there's so much history, and it's only going to continue to develop. I don't see it dying. If we were able to establish a hall of fame, I imagine it would do nothing but grow." But there are a lot of dots to be connected before anyone even starts writing a business plan. "It's definitely going to be a hard sell," said Hoeksema. The movement, if it can be called that, has as of now a visionary, and a young man very proud of his hometown, and two business development leaders interested in hearing their story, but no definitive leader yet. Whomever that is will have to answer some fundamental questions - who should be honored? Will they even show up? Will such a place have an educational mission? If so, what is it? And every step of the way, who is going to pay for all this? For the moment, Hoeksema and Day aren't opposed to making a unilateral declaration of Ottumwa as the home of a hall of fame, much like Cooperstown did in 1935, and trying to open something, anything. Such declarative chutzpah was, after all, integral to the city's short, but bright, history with video games years ago. It may begin as a list of names on a plaque, and a console, and a computer where you can peruse the Twin Galaxies database, in one of the many open shop fronts on Ottumwa's Main Street. Yet who knows. It might one day become the thing we all want it to be, the repository of an art form's history and the shrine to those who wrote it, and all the great games going back to the legends of the arcade, lined up in a great hall. Like wax museum gunfighters in Dodge City again. In the video games capital of the world.